I’m a curry coward. It’s exotic. It’s bright yellow. It has a long ingredient list. So last night I decided to come up with a simple curry that even a curry coward like me can manage to make. I took the easy route and bought a can of curry powder instead of buying ten different spices and making my own. The first batch I made had lots of veggies and chickpeas, but I decided that three ingredients really stood out from the crowd — cauliflower, kale, and roasted garlic. So I made it again for breakfast this morning while the baby was napping. The life of a food blogging mama! This time I just used those two veggies and a whole bulb of roasted garlic. Much easier. Much better. I don’t know if brown sugar is a classic addition, but I found it really balanced the strong curry flavors nicely. 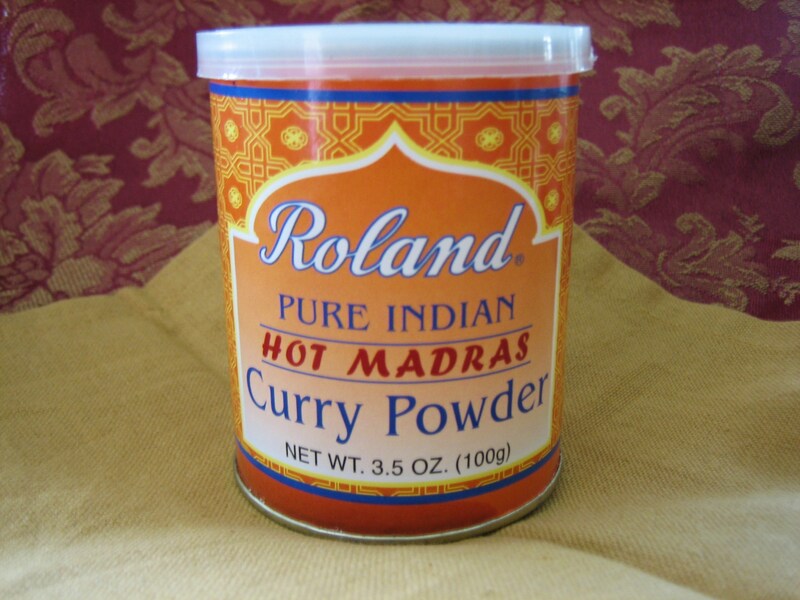 Curry powders can vary from brand to brand, so you may want to taste the seasoning as you go to see if it needs adjustments. Here’s the kind I used. Are you intimidated about making your own curry too or was I the only curry coward? What other dishes would you love to make but haven’t because they seem to complicated or overwhelming? I watched Michael Symon on The Chew sharing tips on plating food and I thought I'd give it a try. Professional, eh?! Preheat oven to 350 degrees. Cut off the top of the garlic to reveal the top of each clove. Put the bulb on a piece of foil, drizzle olive oil on top, and wrap the clove tight with the foil. Put in the oven (directly on the rack is fine until you get the cauliflower in). In a large bowl, toss the cauliflower “trees” with about 1 tbs olive oil. Tossing as you go, gradually add 1 tsp curry powder, 1 tsp brown sugar, and 1/2 tsp salt until evenly coated. Place on a large baking sheet sprayed with nonstick spray and put in the oven. (Move the garlic onto the baking sheet at this time.) Set the timer for 20 minutes. In the same large bowl, toss the kale with 1 tbs olive oil, using your hands to massage it into the leaves. Tossing as you go, gradually add 2 tsp curry powder, 1 tsp brown sugar, and 1/2 tsp salt. Put the kale on a large baking sheet sprayed with nonstick spray. It will be crowded, but that’s okay, we aren’t looking for crisp kale chips so it can be a little crowded. Add the kale to the oven, leaving the garlic and cauliflower in too. Cook everything for 20 more minutes. You might want to give the cauliflower and kale a shake every now and then. In a small sauce pan, heat 1 tbs olive oil on medium heat and add 3 tbs of curry powder. Stir and cook for about 2 minutes. Add 2 tbs brown sugar and 1 can of coconut milk. Stir. When the timer goes off, turn the oven off and remove the garlic. You can leave the kale and cauliflower in the oven to stay warm while you finish up the sauce. Carefully (it will be really hot) take the garlic out of the foil and squeeze it into the curry sauce. You can just stir it in if the garlic is really oozy or put it into the blender for a few seconds to evenly incorporate it. 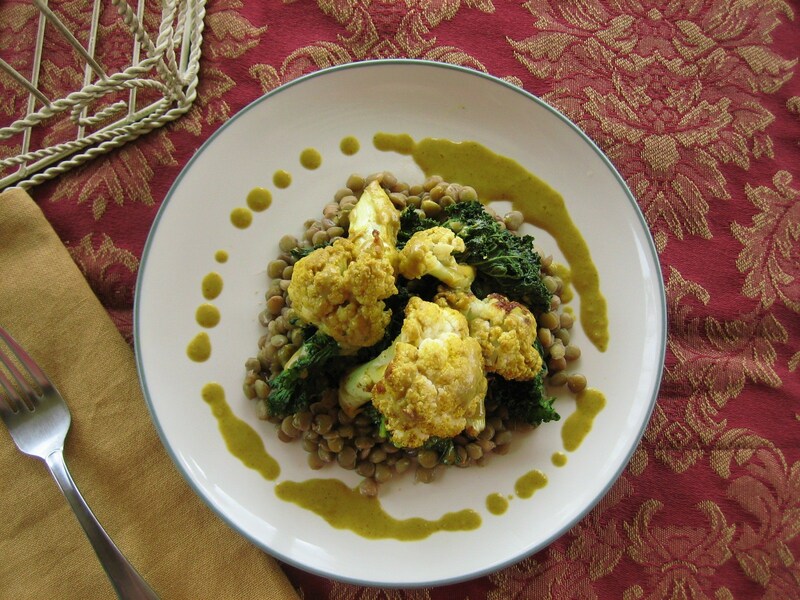 Serve veggies on a bed of lentils and top with curry sauce. And just like that I’m over my fear of curry and you can be too! 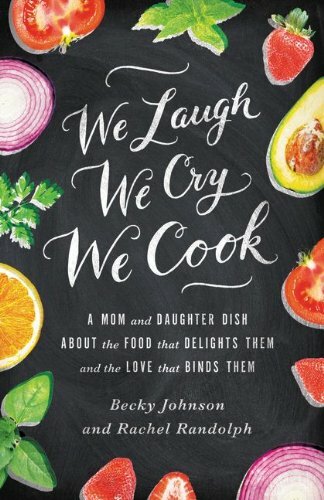 Really lovely recipe and great photos!! 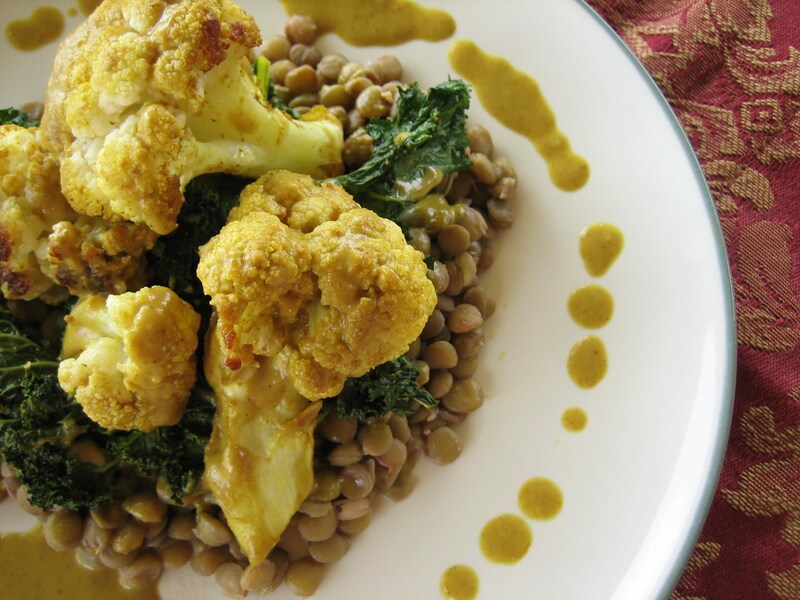 I love cauliflower, lentils and kale 😀 yum!